Attending a service at St. Andrews Church, Quebec City last month when visiting Quebec City was an important moment in my genealogy journey. Back in 1818, February the 4th, my 3x great grandmother Elizabeth Tipper was wed to Robert Jeffery/Jeffrey. The minister Alex Sparks wrote as Tupper for the bride’s surname and it took about 15 years to figure out her surname was actually Tipper. The first event at the St. Andrew’s Church for my family was the marriage of Elizabeth Tipper to Robert Jeffery in 1818. A side note is that Chev. Robert d’Estimauville was a witness to both Elizabeth Tipper and her sister Anne’s marriages, and I have yet to find the connection. I have been to Quebec City on a few occasions but St. Andrew’s, which is the oldest church of Scottish origin in Canada, is only open on Sundays for service. I have only been inside once before and that was many years ago. On a Sunday I made my way to the church early and enjoyed sitting on the stairs outside the church, reveling in the knowledge that this is a very special place for my family. The welcoming lady seated on the pew beside me directed where to get the Hymnal book and I waited for service to start. People continued to trickle in and I was happy to see some families with young children in attendance. And then the organ played. What a fantastic sound that echoed through the room. A few tears gathered at the corner of my eye as I allowed myself to bask be in the moment. After service, I took a few minutes to photograph the interior as I do not know when I will be back. I was welcomed to have fellowship after in the Manse but my travel companions were waiting, maybe next time. Part three of a series I am writing about the Jeffery sisters. If you want to read more Part I & Part II are here. Hannah was almost a New Years baby, as she was born Dec. 30, 1832, in Quebec City. At her baptism, the following month which took place at St. Andrew’s Church, Alexander Jaffrey (likely her brother) and Mary Fletcher became her godparents. In the 1852 census, Hannah at nineteen is working as a servant at the home of William White an accountant. The White family lived in a two story house, with parents Mary & William, two young children, a sixteen-year-old young man as well as another servant Mary Ganatry from Ireland. Hannah Jeffery in the White household in the 1852 Canadian census. In 1854 at St. Andrews Church, Hannah married a ship Captain from Great Yarmouth, England, Richard Lee Norton. Her younger sister Elizabeth along with her husband George Robertson were witnesses. Hannah’s life seems fairly straightforward compared to her sisters, she had eight children, six boys, and two girls. Alfred the youngest son died at the age of eight of Arthritis and her daughter Elizabeth succumbed to the flu at the age of 34. I have found the name of only one of the ships her husband captained and that was a steamer ship The Montmorenci, which was mentioned in their son Thomas’ baptism in 1857. In the 1891 Canadian census, the Norton family is living in Montcalm Ward, Quebec City. Hannah is listed as the wage-earner, working as a caretaker, her husband Richard, age 77 is unemployed. Hannah is the only one in the household who cannot read or write, her sons still at home are working as a beer bottler and Express driver. In 1893 Hannah’s husband Richard passes away and is buried at Mount Hermon Cemetery. I am told Hannah and her daughter Caroline never lived apart, when Carrie married Peter Jordan in 1900 I assume Hannah joined them. The Jordan family moved to Montreal about 1910 and seven years later at the age of 84 Hannah passed away. Her body was brought back to Quebec City for burial with her husband Richard at Mount Hermon Cemetery. *No matter how much I have searched on various record sites Hannah is still ‘missing’ in the 1901 & 1911 censuses. One thought is she could have been visiting her children on the night the census taker came knocking and was missed. Caroline Jeffery was born to parents Robert Jeffery & Elizabeth Tipper on April 22, 1821 in Quebec City. She was baptized on the second day of May of the following year in St. Andrew’s Church. Her godparents were John McCourt and Catherine Chamberland. The Jeffery family moved around a bit as Caroline’s father Robert worked as a stone mason traveling to wherever he was hired. When Caroline was 13 years old the Jeffery family was living in St. Etienne, Beauce as their father was building a mill for George Pozer. The next record (if I could find it) for Caroline would be when she married Frederick Yeates/Yates about 1840, she would have been 18 years old. Frederick possibly was a militia volunteer for the British Army as this name shows up on Muster Rolls at Ancestry. The young couple had two daughters both named Elizabeth. The first Elizabeth was born in 1841, and baptized on the same day as her aunt, Julia Heathfield Jeffery. The death of little Elizabeth has not been found but another Elizabeth was born to Caroline and Fred in 1845. She died two years later in 1847, her father’s occupation is noted as a merchant. Shortly thereafter Fred also died although no record of his death has been located. In 1851 Caroline (Jeffery) Yates marries James McKay in Montreal’s Erskine Presbyterian Church. 1859 brought another attempt for children with the arrival of baby Caroline in Cleveland, a village close to Richmond, Quebec. She did not live very long, and a son James followed her but it is likely he only lived a few days. In the 1871 census the McKay’s are living in Richmond, and I finally learn a little about Caroline’s husband, his occupation is a painter and he was born in Ireland about 1819. A painter leaves me with the question, did he paint houses or was he an artist? The 1881 census does not reveal anything new about the couple. Caroline dies May 20, 1885, I am still looking for the record of her death, she is buried in Saint Anne’s Cemetery, Richmond, Quebec. I am in possession of my grandmother Beatrice (Jordan) Dever’s papers that consist of numerous items from her involvement with the Rebekah Assembly in Quebec, the female branch of the I.O.O.F. Her passion for this organization led her to numerous positions throughout her lifetime and I know she was especially proud to serve as the International President in 1957-1958. Going through this collection I realize that there is probably items of interest to people outside of our family. I am looking to donate her papers, photographs, and other items to an archive in the future, but for the moment I thought I would share some of the things that may have a wider appeal. The first item I want to share is a listing of the members whose names were on the Charter of Cresent Lodge No.18 in Montreal which was organized on Oct. 1, 1907. A quick google search did not turn up more information on Cresent Lodge. *This information is from a list that is handwritten and any transcription errors are from me deciphering the writing. I wish full names had been listed but this is how it appears on the sheet. I have organized them alphabetically by surname. 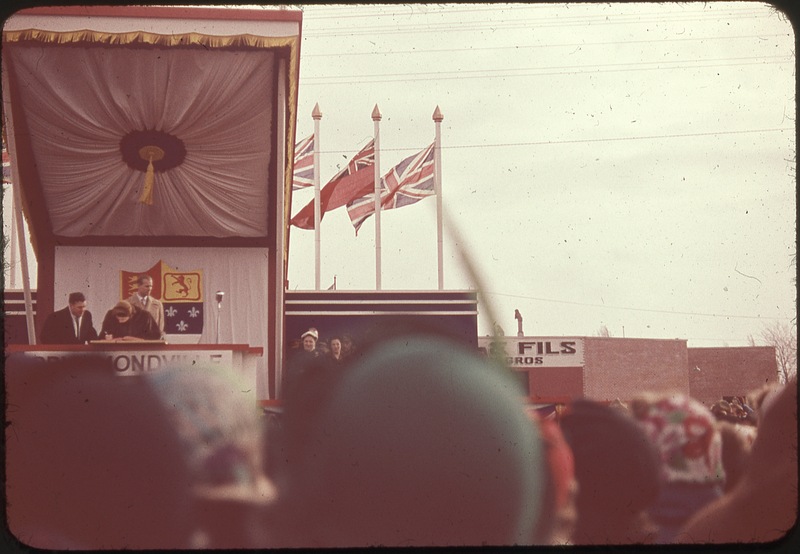 Princess Elizabeth visits Drummondville, 1951. 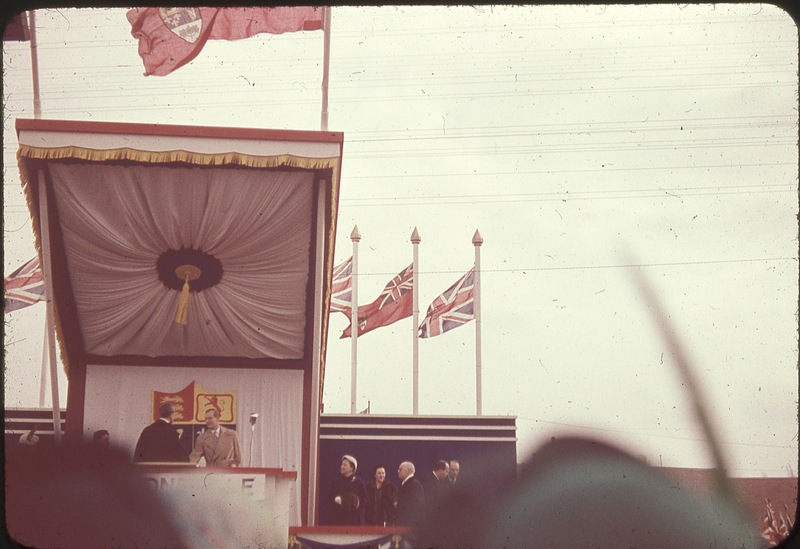 I also found this video on You Tube of the future Queen’s 1951 visit to Canada. Maybe I can find a video of when she was in Drummondville and spot my father and his parents in the crowd! These pictures are from a few slides that have been passed on to me from my father.